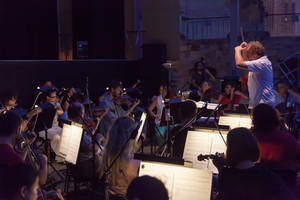 Giuseppe Verdi’s Aida by Opera Spanga – Not your average museum piece. I’ve got much to say about this rendition of Aida, so I’ll start by saying that I recommend it. Whether you’ve watched Aida, or haven’t yet, or don’t watch Opera at all, I recommend it. 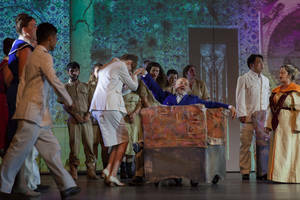 Van Eijk’s take on Giuseppe Verdi’s Aida is not your average museum piece. This Aida immediately sets itself apart by being set in modern times. This, though, is much more than a lick of paint, modern fashion and nothing else. While the characters are still perfectly faithful to the original script they are set against a backdrop of modern customs. This makes the character interactions take a whole new direction, one that I found fun to delve into. Amnesis takes remarkably well to this setting. She is free to be promiscuous and direct in her advances to Radames and pompous and capricious to everyone around her. It contrasts so well with the more sly and underhanded part of her nature. Eva Kroon took to her role excellently, as we see Amnesis do her best to put herself at the centre of everything to try to steal Radames’s heart (and the show). This creates an excellent contrast with her love interest Radames. 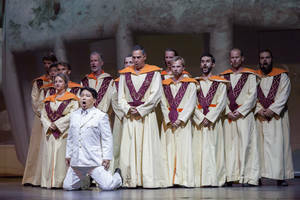 Stoic and inexperienced in the beginning of the opera, in a way that comes off as almost prudish, but he is played by Tao Tong in a sympathetic way. From a contemporary perspective these character traits make him into an anti-hero, a pawn that everyone wants to use in their game. When he finally comes into his own, standing his ground despite being imprisoned, the audience is drawn to his heroism. Personally, I found Aida’s actress the best singer. Maribeth Diggle’s incredible voice makes Aida’s moments enthralling. There’s an intensity to the way she speaks that really brings her moral dilemma, her stress and her emotional nature to the forefront. I only took issue with what I thought was that Diggle did not have all too much of a stage presence. When she sang I often lost interest in what she was doing on stage and instead looked at something else while enjoying her top notch vocal work. It was Slavoj Zizek who spoke about humour being used in war to maintain an “ironic distance” from the acts of violence that are committed. Van Eijk’s sense of humour laces the play with this effect. Her jokes could be subtle, banal, playful or sardonic. Not only are they entertaining but they cement the forward-thinking nature of the opera’s anti-war message. This is compounded by the modern setting, which reminds us that the senseless hate and war in the play is right on our doorstep, about half a sea away. It also brings into question religion and what kind of power and influence it carries in the modern day. These themes are delivered with intelligent subtlety, as is the musical score of the opera. It is almost completely faithful to the original, with only a few notes lost. This, when paired with the smaller orchestra give it a much subtler sound, each detail can be very clearly heard. This is something that can be appreciated very well given the architecture of Pjazza Teatru Rjal. All in all, its outstanding conducting by Wijnstra. 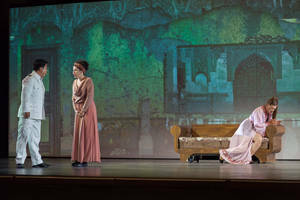 This production by Opera Spanga on the 13th and 15th September has been masterfully prepared. It is subtle and engaging, well performed and intelligently put together. It’s flaws are simply too minor in comparison to the skilful way the play is presented, once again, I recommend it.